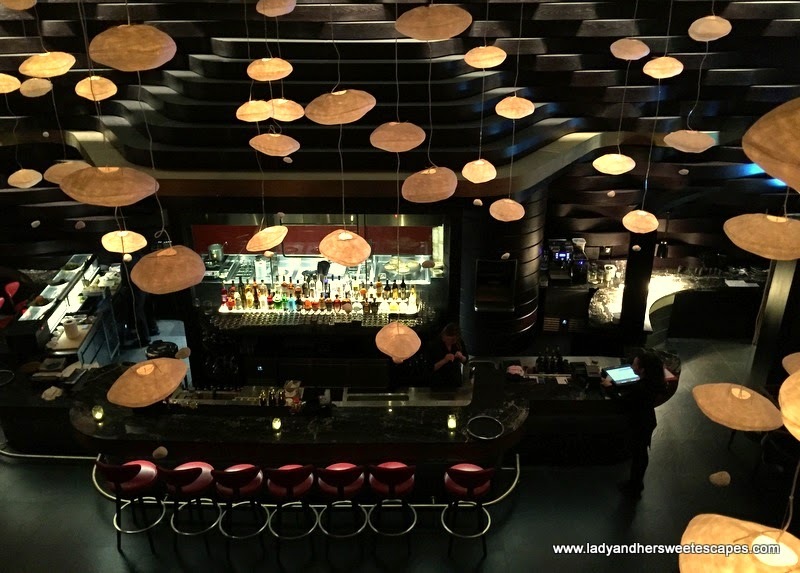 Saturday night, Ed and I were introduced to one of New York's finest restaurants that has just arrived in Dubai: China Grill at The Westin in Mina Seyahi. It is not a "Chinese" restaurant. It is a culinary destination where East meets West. NYC's award-winning restaurant, now the freshest and the hottest dining spot in Dubai, serves Asian-inspired World Cuisine; a beautiful combination of international recipes and Asian touches. The ambiance at China Grill is beyond compare. The feel is upmarket; from the elegant red elevator that whisked us to the trendy lounge to the sophisticated main restaurant located a level below. We were invited to have some drinks at the bar before we proceed to dinner, but we politely declined as Ed was nursing a cold and I don't drink. But I guess that's how dining at China Grill should be; commence with a few drinks at the lounge, then head to the main restaurant once you've succumbed to the chill vibe. Our spot faces the open kitchen; hence we watched the chefs create magic in between conversations. The semi-private seating is so conducive to unrushed dinner. We spent a little less than two hours and every minute of it was amazing. As our server knows the menu by heart, we felt it was right to take his recommendations. We started with two small plates and a salad. First served was the Jalapeno and Lime Cured Scallops. The scallops remained delicate, but nicely piqued with spicy and tangy flavors from the jalapeno and lime. With the creamy taste from the coconut and hint of sweetness from the watermelon, it was such an exotic welcome treat. And then our salad choice left us almost speechless. The Beijing Duck Salad has a harmony of textures; fresh greens, savory duck meat, crispy wontons in blood orange dressing! It's so good that we were able to finish the generous portion. My date can't get enough of the salad! Our second dish from the small plates was the Salt and Pepper Soft Shell Crab. It's another wonderful creation made for seafood lovers. Thin batter envelopes the soft and juicy crab. Explosion of flavors came when dipped in Yuzu Ponzu; a tasty and tangy soy dressing. From the Dim Sum selection, our server recommended King Scallop and Lobster Siew Mai. It's the finest dim sum we have ever tasted by far. It's also the most unique as it comes with shots of lobster broth. It was explained that the proper way of having it is to take a bite, chew and wash it down with a shot of broth. The end result? Exquisite and creamy blend of flavors that lingered in our taste buds. From the extensive list of Maki, I chose the California. There are eccentric varieties on the menu, however I was really curious on how my favorite maki would taste like in a 5-star venue. China Grill's California Maki has sticks of king crab which made it extra-special. The taste remained simple and delicate, just how I like it. Ed and I were surprised with the massive portions. I honestly thought "small" in "small plates" means a serving for one, but it turned out to be perfect for sharing. I was actually ready to call it a night when our server said we can't leave without trying China Grill's specialty from the Large Plates selection. So, a serving of Grilled Garlic Shrimp with Black Fettuccine was brought to our table. And we were so happy we didn't say no. The dish is very interesting. The pasta is black in color as it is naturally enriched with squid ink. The gigantic shrimps were grilled to perfection. The red curry sauce has a full rich flavor which complemented the subtle taste of the pasta. I also adore the bonito flakes; so thin that it gracefully danced on top of the pasta dish. I love its smoky flavor as well! I had an icy mocktail and Ed was stuck to his glass of water (blame the common cold) while we had our main dish. I had the Pineapple and Coriander Crush which is a taste of summer! The refreshing drink is a Siamese trilogy of pineapple, lime and coriander. Our choice for dessert was a show-stealer; such a lovely surprise as it is simply called Bananas In A Box. It came as a chocolate dome which opened to a glorious dessert when flambe with rum. Watch our amateur YouTube video below! The show created great anticipation. We immediately devoured the extraordinary dessert and realized that it's a superstar until the last bite. It has everything; crunch from the macadamia nougatine, comfort from the caramelized banana and vanilla ice cream, and intensity from the rum! Ed and I are so glad to discover a dining destination that we can highly recommend. China Grill is the perfect venue when you're celebrating something special or simply when you want to reward yourself after a long day at work. We all deserve a lavish treat time and again, right?